Despite the EU sanctions, the Central Bank of Russia has increased its gold reserves. The Central Bank of Russia has a chance to keep the price of gold at the same level. Foreign banks are afraid to buy gold in Russia. The EU sanctions against Russia associated with the crisis in Ukraine had little impact on the Russian market at the level of the banks. Russia rallied even more and can improve its economic situation without any help. The Central Bank of Russia actively helps its country to increase gold reserves by buying gold from the Russian gold mining companies. Moreover, this position assists the price of gold to stay afloat without significant changes. Before the sanctions, the biggest part of the mined gold of the Russian gold miners was sold to VTB, Sberbank and some other major players of the gold market, and they, in turn, sold it to the Central Bank and foreign buyers. Now the Central Bank can buy gold out of the queue, because foreign banks have to take a pause in buying the yellow metal due to restrictions, though this type of operation was not prohibited. According to Reuters, the Central Bank has taken the position to support commercial banks and help them to survive through hard times, as well as to maintain the liquidity and the price of gold. 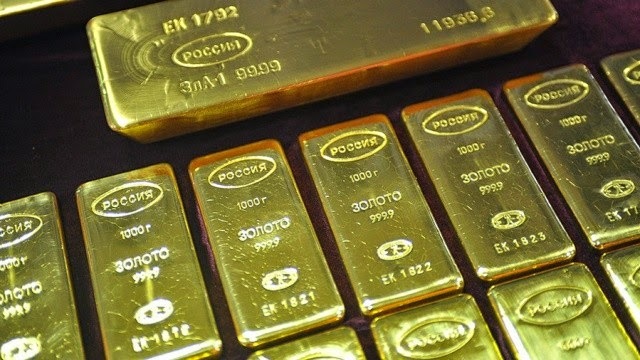 As it is known from free sources, by the middle of this year, Russia increased its gold reserves by 115 tons, which is almost twice more than last year. And for the first half, the country ranks sixth with 1 094.7 tones of gold among the world's largest holders of the precious metal. The clients of the Emgoldex, by buying gold in the online store, are always in a favorable position. Regardless of the price of gold, they can buy it to replenish their reserves and preserve their savings, in addition, Emgoldex enables to create their own gold business. Let your friends use this opportunity to change their life for the better! Share this useful information with them!